Cuddle up on the couch in style with your very own personalised snuggle blanket. Wonderfully soft and warm, it feels like a giant hug when wrapped around you. Choose from four sizes and print your special memories on one or both sides for a totally original gift idea. The double thick polar fleece is anti-pilling and water repellent, so take it anywhere for on-the-go snuggles. A personalised snuggle blanket is a must have for all ages, because nobody grows out of getting cosy on the couch do they? Available in four sizes in landscape, portrait and square, you can create cuddly blankets for your children to use in the car on long journeys and even as a luxury, large bed blanket. Weighing 570 gsm in total, two layers of 285 gsm polar fleece are hand stitched together, resulting in an extra warm furnishing that feels as good as it looks. Really happy with the standard and quality of the product. My sister just loved it! It was just gorgeous. A special picture for my sister’s birthday. And it made her cry nice tears. Quality was excellent every which way. Service was super fast and so efficient. Very impressive. Thank you. First class service and beautiful product. Highly recommend this retailer. Quality excellent great present for birthday all photos very clear and colours good. Thank you very much. Design three snuggle blankets for the price of two. 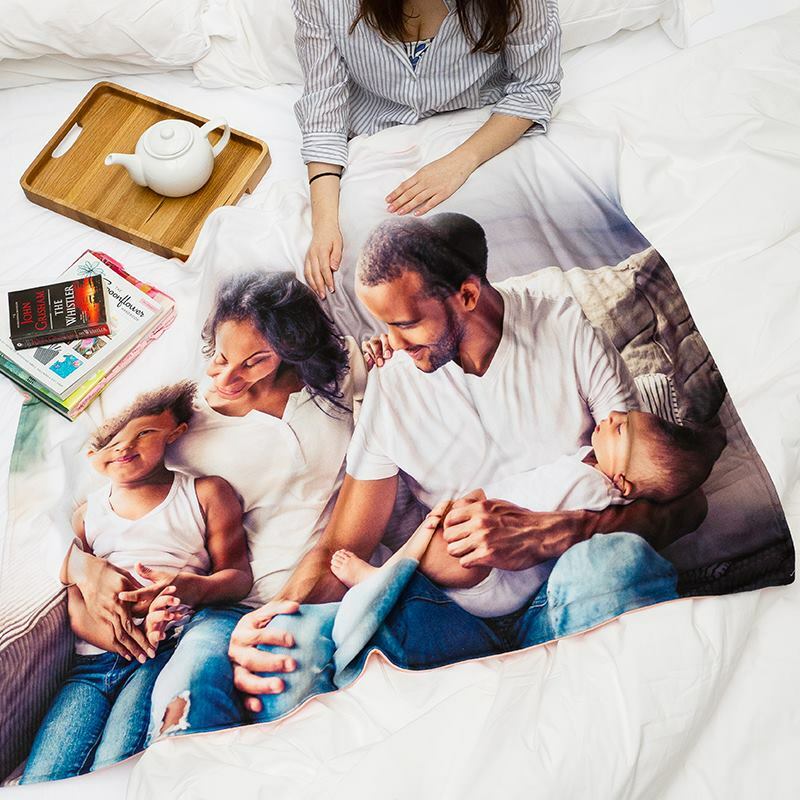 Each one can be printed with different or the same designs, simply make sure there are three blankets in your basket and the discount will automatically be applied. Your snuggle blanket is completely handmade to order in our London studios, using the softest polar fleece fabric and exceptional printing methods. The inks are fused deep into the surface of the fleece, so your designs won't peel away or scratch off. Two layers are stitched together, with the backing layer featuring either your choice of colour or more photos. The discreet hem and optional label are hand sewn, guaranteeing a flawless finish. Care: No matter how many snuggles you have with your blanket, it'll remain soft and beautiful for years to come if you follow these easy care instructions. Simply machine wash at 30°c and leave to dry naturally. You can tumble dry on a low heat but do not wring out. Your designs won't crack or peel over time with use or washing, and we offer a 10-year guarantee on the print life, fabric quality and stitching finish. Please note: As everything we provide is handmade to order, all sizes may have a slight variance. The photo reproduction is high definition, so you have total creative freedom when it comes to your design. Whether you have a minimalist design or one with intricate details, you can be confident that the finished result is sublime. The backing comes in 4 colours; soft pink, pale blue, black or ivory cream, so choose one that complements the front, or alternatively, opt for double-sided printing. Having this extra space gives you many opportunities, such as printing a message, a contrasting design or pretty pattern. During the cold weather or times when you're feeling low, lift your spirits with a customised snuggle blanket. You can curl up on the sofa wrapped up in your special blanket, printed with photos that make you happy or words of encouragement. Keep a snuggle blanket in the car to ensure your children are comfortable during long journeys. Printed with their favourite cartoon characters or animals, it can help to soothe them and keep them calm. Each child can have their own snuggle blanket featuring their name, so there are no squabbles on the backseat. If you have a little area where you go to chill out, enhance this relaxation area with a sumptuous cuddle blanket. Printed with photos from your favourite piece of artwork, it's a beautiful way to read, meditate or simply have a nap in peace.